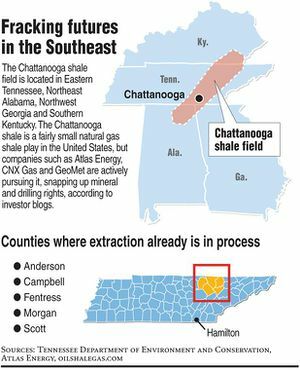 Tennessee sits above the Chattanooga Shale, which has been slated as a site for increased drilling and fracking. By 2013 six natural gas drilling companies had looked at mineral rights and property leases in the Chattanooga Shale play. As of February 2013, there are fracking wells in Anderson, Campbell, Fentress, Morgan, Overton, Pickett, Scott, and Union counties in Tennessee. Atlas Energy has bought up 105,000 acres in eastern Tennessee. The company believes that this property could contain up to 500 potential horizontal drilling locations. Environmental groups speculate that a drilling lease already has also been made in eastern or northern Hamilton County, TN, based on industry blogs. According to the Tennessee Clean Water Network, a process called nitrogen fracking is occurring in Tennessee, which involves the injecting of nitrogen and 2-4 tankers of water into a gas well in karst geology. A representative from Atlas Energy stated that the Chattanooga Shale is too fragile for high-pressure water fracking treatment, so nitrogen gas will replace some of the water. On September 28, 2012, the Tennessee Department of Environment and Conservation (TDEC) and the Tennessee Oil and Gas Board (TOGA) passed regulations to govern the oil and gas industries. Establish a baseline system for monitoring water quality before and after drilling. Notify the public before any wells are hydro-fracked. Match state standards with the industry standards formulated by the American Petroleum Institute. According to critics, the rules passed ignored the recommendations. Most notably, the rules contain a 200,000-gallon threshold: if fewer than 200,000 gallons of water are used to frack a well, the industry is not required to monitor groundwater or notify the public. Yet it is estimated that most fracking jobs in Tennessee would require less water. In March 2013, the University of Tennessee proposed allowing an outside company to drill on about 8,000 acres of mature woodlands it maintains as an outdoor laboratory in the Cumberland Plateau — all while performing research on the effects of the process on water quality, air quality, and ground impacts. Gov. Bill Haslam is supportive of the university's proposal. Gas driller Consol Energy hired Bryan Kaegi, a fundraiser for Tennessee Republicans, to help shepherd the proposal through the approval process. The Governor of Tennessee, Bill Haslam, is an oilman and stands to profit from petroleum and gas. The Haslam family of Knoxville, Tennessee founded Pilot Travel Centers in 1958, which merged with Flying J in 2001. In 2012, the Haslam family purchased Western Petroleum and Maxum Petroleum, which are both major suppliers of fuel to the gas drilling and fracking operations in the U.S. The Haslam family will also start installing natural gas fueling pump stations, and plan to have 100 truck stops capable of fueling 18-wheelers with liquefied natural gas. ↑ 1.0 1.1 1.2 David Whiteside, "Fracking goes south," Tennessee Riverkeeper, Feb 20, 2013. ↑ Pan Sohn, "Stage is set for fracking in Tennessee," Times Free Press, Jan 28, 2013. ↑ "What is fracking?" Tennessee Clean Water Network, accessed Apr 2013. ↑ David Cook, "David Cook: Fracking comes to Tennessee," Times Free Press, Sep. 28, 2012. ↑ Kristin Hall, "University Of Tennessee Fracking Proposal Allows Drilling On Their Land," AP, Mar 15, 2013. 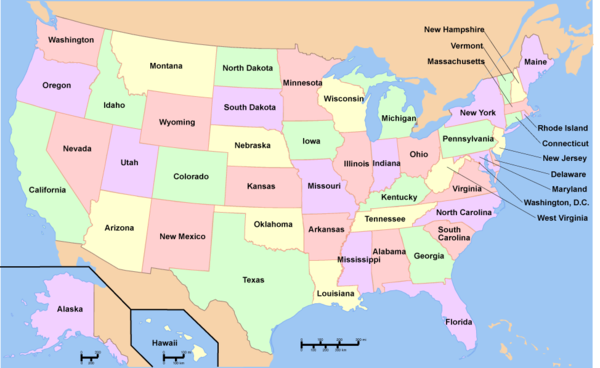 Wikipedia also has an article on Tennessee and fracking. This article may use content from the Wikipedia article under the terms of the GFDL. This page was last edited on 10 November 2015, at 08:27.